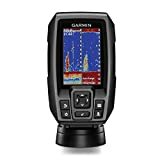 Best Fish Finder Under 300 Dollars - The Top Fish Finders for 2019! Best Fish Finder Under 300 Dollars – Top Picks for 2019! Modern technology has really fine-tuned fishing. Fish finders are one of the main game changers on the water today. However, these pieces of equipment can be very expensive. Some going for several thousand dollars. Here, we are focusing on the best fish finder under 300 dollars. For just $300 or less, you can get a very effective, reliable fish finder. They will help you navigate the lake as well as show you in vivid detail what’s below you. Following are detailed descriptions for the fish finders on this chart. all of which are available for less than $300. This list has been updated for 2019 and all of these options are also the best fish finders for 2019. Pair your fish finder with a great shimano reel for an even better catch! It always helps to visually great down the options. This table lists our candidates for the best fish finder under 300 dollars and their individual features. Part of the all-new Striker series from Garmin, the 5CV is a quality fish finder that can be used year round. The Striker 5CV has a 5″ display screen, which is measured diagonally. This display screen is compact and easy to use. The strong materials make it excellent for fishing in harsh weather, and it is waterproof. With the GPS mode, you can mark exactly where you catch fish and return, as well as control your speed as it does monitor that as well. However, it is noteworthy that this fish finder is not compatible with mapping, so the GPS is basically there to show you where you have gone and to save your hotspot marks. The 5CV also has some extraordinary depth capabilities, marking down to 2,300 feet of freshwater and 1,100 of saltwater! That’s right, this fish finder is also fully functional on saltwater, at some great depths to boot. This fish finder is extremely portable. You can actually purchase a kit to mount it anywhere you want very quickly. This is important for kayak, canoe, and ice fisherman who are constantly on the move. This fish finder is fascinating as it does have a flasher as well. It functions the same way that many state-of-the-art flashers would, allowing you to see the hardness of the bottom as well as mark your lure and obviously fish as well. The Striker may be the most expensive out of these 5, but if you are looking for a fish finder that you can use year round, hardwater and open water, this is the way to go. The one knock is the lack of mapping capability. If this is important to you as you like to see the bottom on a map, read on to our next fish finder. 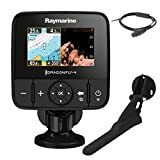 The Raymarine DragonFly-4 Pro is a beautiful fish finder, and it functions wonderfully as well. The display screen size is 4.3″ diagonally, which can also be split to show standard sonar, down imaging, and GPS. This system will also show your speed, depth, and water temperature. With the GPS, you can mark your hotspots, and you can also take screenshots of underwater structure! One very neat thing about this fish finder is that it is compatible with your phone or tablet through use of an app. This means no moving the fish finder around the boat with you – you can watch your phone from anywhere with it. Fishing partners on the boat could also watch it on theirs as well, so no more crowding around the fish finder! With this app, you can also rewind and look back over the route you covered to see if you missed anything or to see exactly where the piece of structure was you landed the wall-mounter off of. The Dragonfly-4 Pro comes stock with many maps so you could fish with it right out of the box. The maps it comes stock with are C-Map Essentials, but it is also compatible with either Navionics or Raymarine Lighthouse maps if you prefer either of those. However, they would be a separate purchase. All in all, the Dragonfly-4 Pro is about the best bang for your buck you’ll find – beautiful down imaging to clearly see the structure, effective sonar, and a good GPS system all wrapped into one. If you have fishing buddies rubbing shoulders to watch the fish finder, this may be the one to buy! Have them download the app on their phones and fish on in peace. From one of the big names in fish finders, we have the Humminbird Helix 5. This is one of their more basic fish finders, and actually, it doesn’t have the option of tracking by GPS or mapping. It does have a 5″ diagonally measured display screen that can be split to show both down imaging and traditional sonar, as well as water temperature. The depth reading on this fish finder can reach up to 600 feet. One of the more plain fish finders that Humminbird offers, this one can still be updated or upgraded through their website for some small upgrades they offer to enhance performance. For the price, you are getting a solid fish finder that will show you the bottom in great detail through down imaging, as well as find the fish, from a great name brand in fishing. Even though the Hummingbird Helix 5 fish finder is lacking in some of the additional features like GPS tracking and mapping, it still provides plenty of value at a high quality. If you’re looking for the best fish finder under 300 dollars, you can’t go wrong with a Hummingbird. 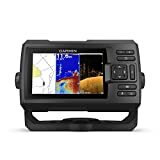 Another big name in fishing, Lowrance has produced an outstanding fish finder here at a great price. The diagonal display size is 4.3″, and can be split to show down imaging, sonar, and a great GPS system so you know exactly where you are on the humps or dropoffs. They saved a bit of money by not having a full color display like the rest. But, they put that money back in where it counts and where other companies didn’t. This fish finder does come stock with about 3,000 lakes around the US. You can purchase map upgrades through Navionics, Lake Insight, HotMaps, and Jeppesen. You can also create your own lake map using their sonar. So, if water levels fluctuate or if stock maps seem to be missing data, you can create maps to save for the future. This fish finder also allows you to plot your route and mark hotspots to return to if you want. You can also track back along the route you recorded to see if you missed any structure or to mark a spot to fish harder next time. This can come in very handy for analysis back at the cabin. As you can see, the Lowrance Mark-4 HDI looks basic in it’s plain greyscale, but it is really anything but basic in its performance. At a great price, this is an outstanding buy from Lowrance. Last but not least on the candidate list for best fish finder under 300 dollars is a Garmin. Garmin brings to us the Striker 4DV, which is a smaller version of the 5DV. The screen display on this is down to 3.5″ diagonally. However, it still boasts many of the same features, with the screen being able to split into any or all of: sonar, down imaging, and GPS. However, this GPS is still as basic as they come. It doesn’t show a map of the lake or anything. Rather it just shows the path you have traveled on and waypoints you mark. It also still does show trolling speed. This is also extremely portable and can be used for ice fishing as well. The size could actually be very convenient, so if you are an ice fisherman or fish out of a canoe or kayak, this fish finder will save some valuable space and still deliver the HD results you’re looking for. The down imaging really helps give you a clear picture of what exactly is going on under the surface. At just $180 dollars, this fish finder is the cheapest out of all 5 while still packing a serious punch. It is really ideal for those looking to conserve space and weight. Maybe you are portaging a lot, or don’t have a large watercraft – either way, this is the fish finder for you at an outstanding price. You will find hundreds of options of fish finders ranging from 100 bucks all the way to several thousand. These shown are the best fish finders under 300 dollars. At this price, they can still last a very long time. And the quality is just as good as other fish finders. Pick one up today and watch your catch rate spike dramatically – the first step to catching fish is finding them! Good luck! Are you looking for something more suited for shallow water fishing? Click here!